A study published in The Lancet HIV shows that HIV-2 is more pathogenic than previously demonstrated. The new findings indicate that early treatment should be applied to all patients with HIV, not only to those with HIV-1. "The study is unique in that we have followed cohort of study participants frequently over a long period, which enabled us to determine when the patients became infected by HIV, as well as to follow the development of the disease. 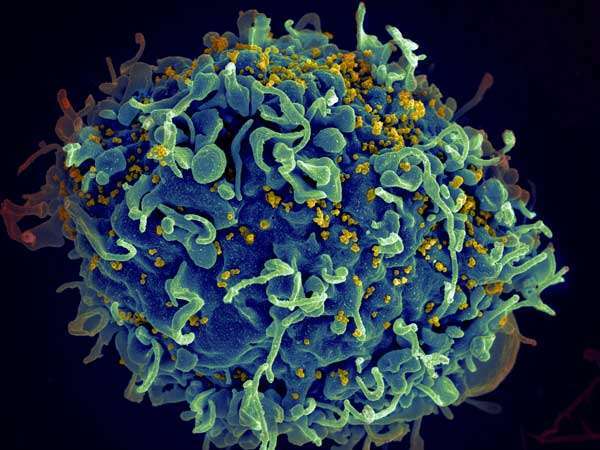 Our data indicates that the majority of those infected with HIV-2 will develop and die of AIDS, something previous studies have not been able to determine," says Joakim Esbjörnsson, associate senior lecturer and researcher in medical microbiology at Lund University in Sweden. The virus types HIV-1 and HIV-2 are closely related, but vary in their dissemination over the world. HIV-1 has spread globally whereas HIV-2, which is considered to be a milder variant of HIV, is mainly prevalent in West Africa. The study is the first ever to present reliable estimates of the time between HIV infection and AIDS or HIV-related death for HIV-2. The researchers followed up on 4,900 individuals in a cohort study in Guinea-Bissau over 23 years, between 1990 and 2013, which involved annual examinations including blood tests. The study also compared individuals infected with HIV-1 with HIV-negative individuals in the same cohort. Data from the study shows that people with HIV-2 develop HIV-related infections and AIDS in an almost identical manner to those with HIV-1, although the process is slower over time. Previous studies have indicated that a large proportion of those with HIV-2, even without antiretroviral treatment, would have a normal life expectancy without any HIV-related complications, unlike those with HIV-1 for whom the absence of treatment led to the development of AIDS in more than 98 per cent of cases. Not even the WHO's treatment recommendations explicitly state that treatment should be offered to patients with HIV-2. "There is a commonly held belief within research as well as in public healthcare about the various types of HIV: that HIV-2 does not lead to disease in the same way as HIV-1. We want to dismantle this belief and change the views on the international treatment recommendations," says Joakim Esbjörnsson. A similar study has not been done previously, as the course of HIV disease is long, and it is unlikely that it will be possible to do something similar again. Joakim Esbjörnsson believes that the difficulty in studying HIV-2 over time is one of the reasons for the general uncertainty about how aggressive HIV-2 is, and also for the prevailing view of when treatment should be started. Another specific problem with HIV-2 is that the majority of HIV-2-infected people do not have measurable virus levels in the blood, which has increased uncertainty as to when and whether treatment should be introduced, according to Hans Norrgren, associate professor of infectious diseases at Lund University and consultant physician at the infection clinic at Skåne University Hospital in Lund. "Furthermore, HIV-2 mainly occurs in West Africa, which is the world's poorest region, characterised by low investment levels and frequent political instability. This not only makes research and development more difficult in the region, but has also contributed to the fact that commercial interest in the development of diagnostics and treatment of HIV-2 has not been equally strong," says Fredrik Månsson, researcher in clinical infectious diseases at Lund University and specialist physician at the infection clinic at Skåne University Hospital in Malmö. The researchers would like to see more research in the field and on treatment for HIV, to better understand the differences between the two types. Among other things, a treatment study over time is needed to verify the usefulness of early treatment for patients with HIV-2.